The Tiny Type Museum & Time Capsule crowdfunding campaign funded magnificently—thank you to everyone who backed the campaign and the larger number of people who provided moral support and design suggestions! I’m now taking direct pre-orders for elements of the project. Most museum are now spoken for (about two-thirds of the edition of 100 I’m making), but you still have time to order one, as well as pre-ordering separately the book I’m writing for it, Six Centuries of Type & Printing, which will be typeset in Monotype hot metal and printed by letterpress. The museum and book are in preparation for delivery in January 2020. I’ve also created a dedicated site that explains the museum, and a blog that I’ll post updates about its progress to. Update: The project was wildly successful, and I’ll be making elements of it available for separate order soon at tinytypemuseum.com. My latest typographic project is now live: I’m raising funds to build up to 100 tiny type museums and time capsules! These little museums will comprise actual historical and modern type artifacts, replicas, and printing samples—like a real museum—and the case and its components will be designed to last for centuries—or longer—like a real time capsule. The cost isn’t low, but I tried to balance the authenticity and lifespan of the project, to give it substance and longevity, with the budget. I hope you’ll take a look at the main reward of the museum, and other campaign items, which include a book and a Linotype “slug” of type. Just got the news yesterday that Roland Hoover, a design mentor from college passed away at the age of 89. He was a letterpress printer and designer, known for his fine book and other printing. I knew him as my boss at the Yale University Printing Service where he was the University Printer. He was cranky and demanding, but generous and supportive—you know: a designer! Very little of Roland's work can be found online, largely because most letterpress work is in limited editions and handed from person to person or retained by libraries. In more recent times, a lot of letterpress posters and cards can be purchased online, but Roland's work was often perishable or commemorative. Here's a notable piece celebrating Gutenberg. Roland's role was twofold: To run the place, which had a full offset printing plant and a photocopying and supply arm, and also a print broker arm of in-house staff that arranged for the many larger projects and books (not Yale Press ones) to get printed around the region; and to set a design tone and style for the university, producing and commissioning work as needed, and sometimes designing and printing posters himself. Roland was far better at the latter, and not terribly interested in the former, but had a great "lieutenant," Joe Maynard, who retired a few years ago after decades of service to Yale. Joe taught me a lot about business and negotiation. Roland and I had a pretty solid relationship, even if I’m sure I drove him nuts. He had little interest in desktop publishing, and I already had five years' experience by 1990 in using PageMaker and then QuarkXPress nearly every day. But we made it work. He was interested in great typography, and so was I, and he taught me a lot of intricacies in thinking about design and how things look on paper. He appreciated the ability to turn ideas into type, but he didn’t always like the type that could be make or the composition that could be set at that time. I also worked closely with Frank Tierney, the staff designer, and Roland on the re-creation of Yale College diplomas, ones awarded to undergraduates. For decades, a local printing firm produced diploma blanks by letterpress, and kept a Monotype hot-metal system alive mostly for Yale to set all the student names. I believe it cost $70,000 a year to print the undergraduate diplomas (about 1,200 a class at that time), and the outside printer wanted to or said it was going to dump its hot-metal system. We worked to transition to laser printing. This involved design testing and sending resulting work to the college library’s preservation department for age and heat testing to simulate conditions after 300 years. It passed. I spent a lot of time in spring 1991 feeding blank diplomas through a large-format Linotype-Hell laser printer. My Yale College class, 1990, received the last letterpress-printed diplomas; starting in 1991, they were laser printed (and I don’t know if that persisted nor how it’s done today). I took their advice, and named my version Furioso after the poem Orlando Furioso—Roland the Berserker. It was meant as a compliment, and I got plenty of great feedback from him as I worked up the font for decades. Roland’s inspiration led 30 years later to my trip to London last year and the book London Kerning, which is partly dedicated to Wolpe and Albertus, and which led me to meet Toshi, the revival designer, and Wolpe’s youngest son, Toby, a fellow technology editor and writer. Roland was a tremendous influence on my creative life, and while I hadn’t been in touch in decades, I still regularly think about the advice he gave me, and use it in my practice. 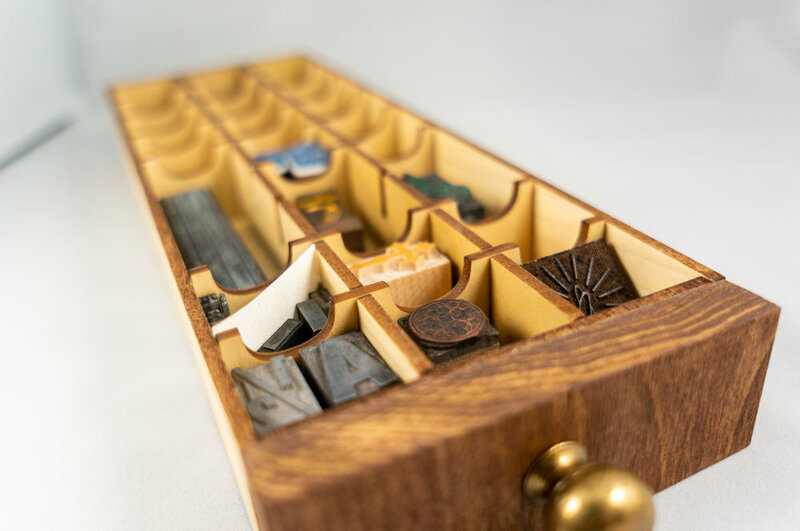 I’m working on designing a small reproduction of the California job case, the classic compartmentalized drawer designed to hold a full font of metal type. Below is a first pass, and I’m working my way through prototypes. Patrons can read the whole story (and get early access to buying one) at my Patreon campaign. Back when I started out in typesetting, production, and graphic design, we used X-Acto knives, wax, and layout boards to put the pieces together for printing. 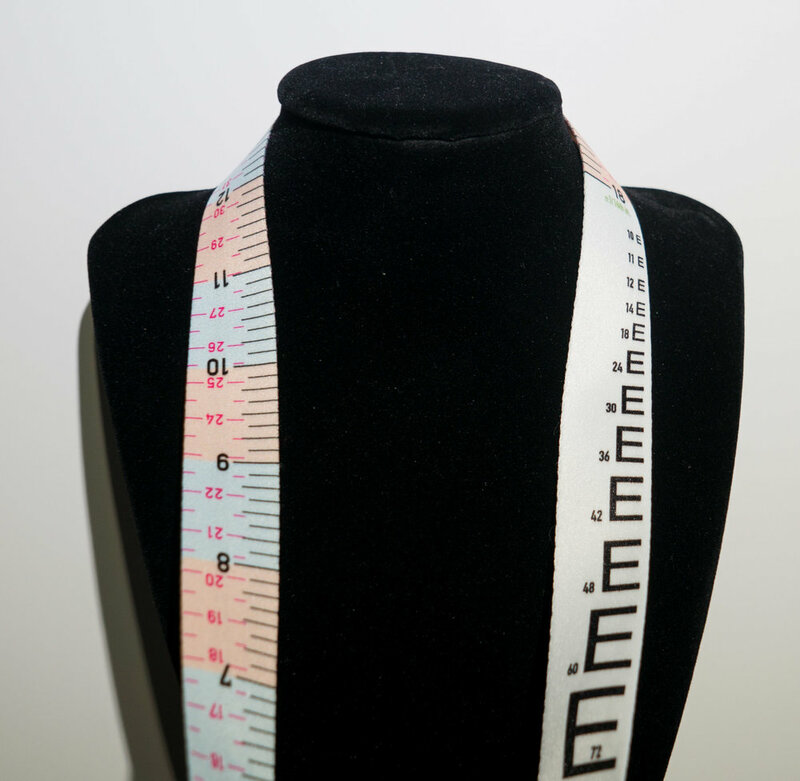 And we all, every one of us and every shop, had a variety of measuring tools that we used all the time. The type gauge and the line gauge were key ones! As the paste-up era ended, and we moved into full pagination output and then ultimately eliminating most or all intermediate steps between digital design and the press. But this year, in which I've spent hundreds of hours in a letterpress shop, I remember how useful it is as a designer to always have measurement tools nearby. Also this year, I met the folks at Buttonsmith, a local worker-owned, unionized, made-in-the-U.S. company that produces buttons, magnets, lanyards, and reels both in mass quantities of their own designs and custom one-off or larger orders. Ah ha! I felt like there was something missing I wanted for myself, and so I designed it. I worked through a few of prototypes and several digital revisions with Buttonsmith to get to the desired results: a type-geek lanyard. It's a silky soft set of rulers (inches marked to 1/8th, picas to 2 points, and centimeters to 5 mm) with some handy type and leading measurement tools as well. You can order directly from me, and if I sell out, I'll take pre-orders for a new batch: $15 each plus shipping, but contact me if you'd like larger quantities. Terrible news. Apple is replacing the long-running convention of typing two hyphens to obtain an em dash or “long dash.” That is, if you type --, many places in the interface in which autocorrection is enabled or third-party software takes advantage of autocorrection, it’s turned into —. Instead, two hyphens become the shorter en dash, or –, which you may never have heard of if you’re not a print or Web designer or otherwise interested in the intricacies of formatting things. To get an em dash, you will have to type ---, a convention that also appears in TeX, a mathematical formatting language developed by Donald Knuth. iOS 11 “smart punctuation” converts dash-dash to an en-dash (–). Am I the only one annoyed by this? I think it should be an em-dash (—). Update: In the release version, Apple contextually replaces -- with — (em dash) to connect words when you type with or without spaces on either side. If you type a number and two hyphens, it turns into a – (en dash). Why is this terrible news? Some have argued with me on Twitter that it’s more logical: - for hyphen, -- for the longer en dash, and --- for the longest em dash. You type more hyphens to get a longer dash. My rejoinder is twofold. First, most people rarely use an en dash, although I’d like to increase that number. Second, a billion people have learned that typing -- leads to a long dash. I may be exaggerating the number, but given that Microsoft Word,* Pages, and other desktop software performs this substitution silently, it’s a widespread convention being overturned. I’d therefore argue this is inefficient, confusing, and inconsistent. If one wants an em dash, one is now forced to type or tap three characters rather than two. It’s confusing, because typing two hyphens will no longer produce the expected result for those paying attention. It’s inconsistent, because it’s unlikely that nearly every other piece of software in use other than TeX that offers an autocorrection for -- will change its behavior to match Apple’s. The long dash also has a particular visual identity that provides the eye with a cue to take a long mental pause, one that's not nearly long enough with the en dash. An em dash, —, is used to set off a phrase—one in the middle of the sentence—that’s not quite a parenthetical, but it isn’t so germane as to be set off by commas. It’s also used as a sort of pause to emphasize something—something important at the end of a sentence. The inestimable Butterick’s Practical Typography, which you should memorize, has more typographic detail. On a Mac, type an en dash as Option-hyphen and an em dash as Option-Shift-hyphen. In iOS, long press the hyphen and pick the option to its right for an en dash and to the right of that lies the em dash. This change appears in the beta release of iOS 11, so it may not wind up in the final version later this year. What makes this more confusing is that in Australia, Canada, and the United Kingdom, typographic conventions shifted, and an en dash with a full word space on either side is frequently used instead of an em dash! Thus our English-speaking cousins have no complaint. My * above references that Word turns [any character]--[any character] into —, but if you type [space]--[space], Word follows the non-U.S. format and changes the hyphens to an en dash. An em was traditionally the width of the height of a font, forming a square metal piece, which roughly corresponded to the letter M in that font, and is a standard unit of typographic measurement. An em dash eventually became as wide as a H rather than an M. An en was once exactly half an em. Spacing in metal type was measured as X to an em, like “3 to an em,” or as X-em spaces, meaning three of those spaces added up to the same width as an em. An em dash often has a hair space (anything less than 5 to an em) or slightly larger on either space to set it off from text. A manual from 1887 notes, “In using an em dash, a hair space should always be placed on each side of it in book work, which gives it a neat and clean appearance in print.” It may be set these days with no spacing at all or a full word space, neither of which looks right to me in print, but works better online. The Atlantic ran a story in 2016 that misidentified the en space. The writer mistook the en space (2 to an em) for any word space. The proper word space in metal-type days was 3 to an em for normal text. 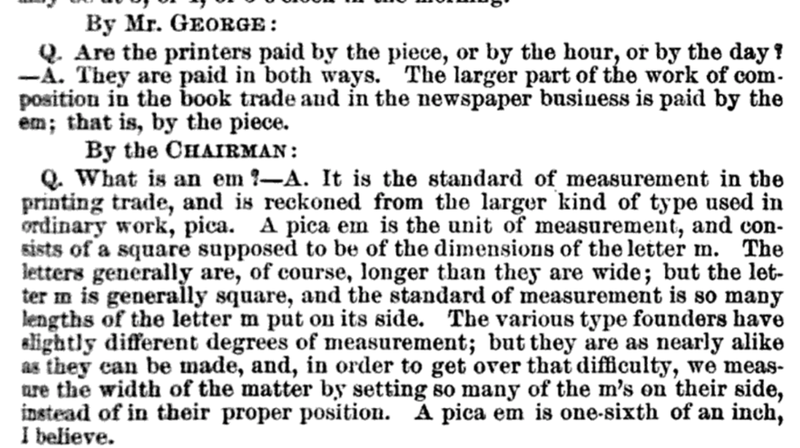 Typesetters in the olden days were paid "by the em," meaning they were paid a fee for how much they set in a given font, no matter the size, which caused all sorts of complications. The past was also full of bad jokes. In a sentence, it might appear as, “Mr M⸻ of Green Bay told Miss B⸻ of Bowling Green that the check was in the mail.” I found a wonderful example from 1852 of someone speaking aloud the term “three em dashes” either due to a typesetting error (a direction to the compositor to use three em dashes was misunderstood) or as a verbalization of punctuation. Typewriting and typesetting have distinctly different paths and purposes, though practical machine typesetting and practical typewriters became possible at around 1880. Typewriting manuals told typists how to prepare business correspondence, but also how to type copy intended to be typeset and copy that emulated typesetting. 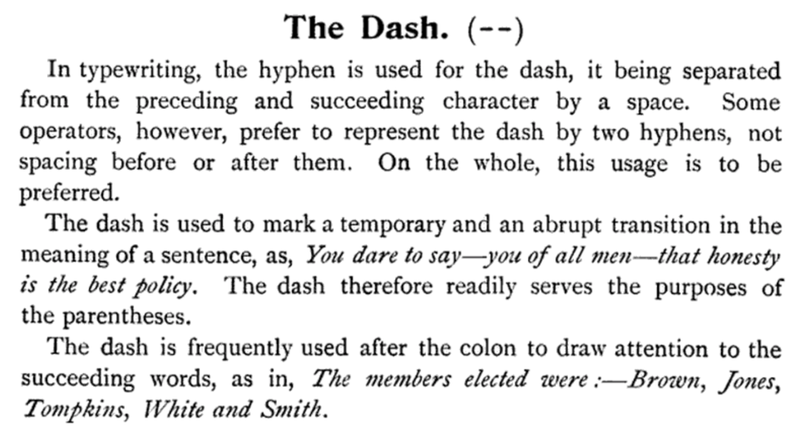 Two hyphens for a long dash dates back to at least the 1890s.